Cassie (left) and Jacklyn Collier with their board game Bundle, intended to bring friends and families together with nostalgia. Who launches businesses in this tech-obsessed society with products intended to entertain that don't require a watt of electricity or a blip of WiFi? At Kids Dinosaur of the Month Club LLC, the answer is a father in Bucks County who, with his wife and two grown children, want to feed youths' fascination with enormous reptiles — and getting packages in the mail. Curious to learn what prompted their foray into entrepreneurship in such a no-tech way, I spent time with their principals, asking lots of questions, and recording the answers the old-fashioned way: with pen on paper. In the Collier household in Mount Carmel, Northumberland County, games were as beloved as the coal-region pizza Cassie, 31, and Jacklyn, 33, swear is better than New York pies. "It's a simple life," Jacklyn, said of her hometown, where her father, Jack, worked in quality control at a plastics company and her mother, Millie, in mental health — and the closest movie theater required a 45-minute drive. "We created our own fun. It was part of our DNA." Poker was their father's specialty. When he wasn't dealing cards at the Collier kitchen table, he was playing for the house at the local VFW. "Bucks for Bonding" was their mother's invention, a clever way of inspiring sibling collaboration by giving them a task to do together and rewarding it with cash. Both sisters would graduate from Susquehanna University — Jacklyn with a degree in theater; Cassie in economics. Jacklyn would go on to get a master's in fine arts from the University of Houston and is currently acting in New York. Cassie graduated at the height of the financial crisis of '08 and '09, so she joined the Peace Corps and went to Nicaragua to teach entrepreneurship to high school students. After that came a master's in public policy at Harvard University and a job in January 2016 as a valuation analyst at Deutsche Bank. The sisters share an apartment in New York. They also share the title of founder of a board game company that loosely dates from December 2013. That's when their Christmas present to their parents was a board game Jacklyn and Cassie made, based on family inside jokes and special memories. It went over so well that they started making board games as gifts for friends. Last year, during a Fourth of July party in New York, someone suggested that the sisters start a company and sell their customized games on Etsy. After a couple of days thinking about it — in part to make sure Jacklyn's enthusiasm for the idea wasn't just the effects of three glasses of rosé — the sisters decided to go for it. 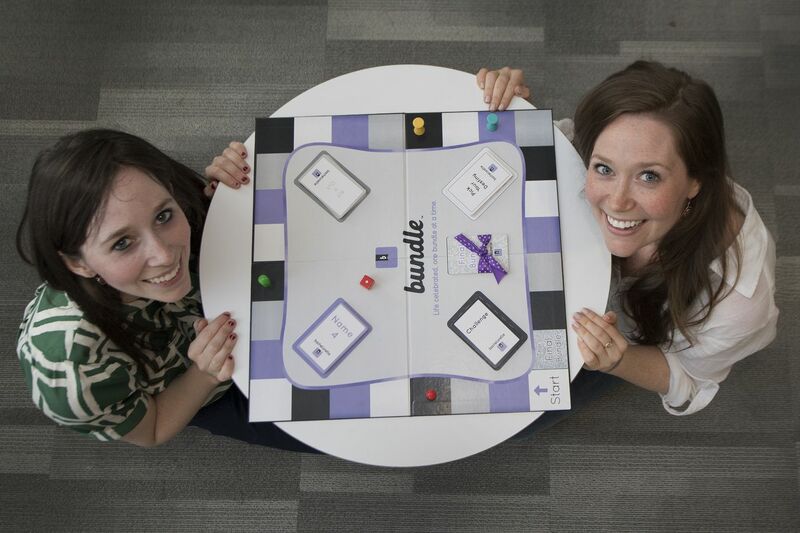 They developed a prototype, built a website at www.thebundlegame.com, secured copyright protection on any text within the game (description, rules sheet, content on the task cards), and, by late September, posted an announcement on Facebook and started accepting orders. Bundle — ideal for a game intended to bring people together over nostalgia — offers three standard versions: couples, family, and bachelorette, each for $35. Customized games, built from client answers to questions the Colliers send them, are $65. A trip around the game board includes required tasks in four categories: Name 4, Act It Out, Challenge, Pick Your Destiny, plus a final command on the last space. For couples, Name 4 might include a requirement to name four restaurants where they've eaten together; for families, to name four vacations spent together. For a bachelorette party, a challenge might be to create an updo for the bride-to-be with only supplies in the room. In May, the Collier sisters (Cassie, left, and Jacklyn) raised $15,000 and generated 200 orders for their Bundle board game. Through a Kickstarter campaign in May, Bundle raised $15,000 and generated 200 orders, the majority of which are for personalized games. The games are being made in Netcong, N.J., and will be shipped from the Colliers' apartment. Cassie has scaled back her job at the bank to three days a week, both stunning and impressing her boss with her announcement that she was starting a board game business. Jacklyn has told her agent she doesn't want any out-of-town acting jobs so she can be available to help grow the company. When they think long-term, tech is involved, including software that writes questions the Colliers now do by hand, "so we can crank out game after game after game," Cassie said. "Eventually, it would be great to have a Bundle app" so people who can't be at the same place at the same time can still play together (think Words With Friends), said Jacklyn, quickly adding, "but we are not tech-savvy." Where they excel, she said, is "real, human, person-to-person contact." No batteries required. Troy Bausinger is a 52-year-old married man from Lower Makefield who majored in journalism at Arizona State University, followed by a long career in publishing and sales. Yet, his current entrepreneurial path started, you could say, in a walk-in closet at his South Williamsport childhood home, where Bausinger would sit and read book after book about dinosaurs. He collected Matchbox cars and G.I. Joes, but he loved dinosaurs. "My grandmother bought me every dinosaur you could think of," Bausinger recalled recently. Thanks in part to the five Jurassic Park movies, dinosaurs are still hot. So, too, are subscription boxes, specialty deliveries of seemingly endless options, including makeup, dog toys, and Shabbat essentials. Bausinger saw an opportunity and took a giant velociraptor stride forward into new-business creation. "I wanted to do something creative," Bausinger said of his motivation. That something is Kids Dinosaur of the Month Club, the source of the Dino Box. For $20 plus shipping, club members receive a different box each order (there are currently 15 selections) containing a toy dinosaur and a collectible information card about that reptile type, along with reading, coloring, and sticker books on dinosaurs. It is a nights-and-weekends venture so far for Bausinger that was nudged into existence by Mother Nature. "The day that Sandy was hitting the Jersey Shore was the day we incorporated," said Bausinger, whose full-time job is as a national advertising sales representative for Philadelphia Media Network, operators of the Inquirer, Daily News, and philly.com. Since the first sale in 2012, annual revenues have grown to $8,000, with Kids Dinosaur of the Month Club turning profitable last year, Bausinger said. Sales could soon take off. Starting the first week in July, Dino Boxes will be available on Amazon.com, said Bausinger, who projects sales "could be a few million dollars" five years from now. That's based on at least 10,000 people buying five boxes on average. Bausinger said his typical customers — young parents and grandparents — buy six. "The dinosaur craze lasts about one year" for a child, said Bausinger, who's clearly not over his yet. Among the Dino Box devotees is Cathy Peruzzi, co-owner of an automobile dealership chain by that name and grandmother of six. Many have been recipients of Dino Boxes, and another will join the group when he turns 3 in March, Peruzzi said. "When that box comes, they are so excited because they know it's a new dinosaur. It holds such appeal," Peruzzi said, marveling at that attraction given that nothing is electronic. "Here is just simple, wonderful dinosaurs that they can use their imaginations with." On Saturday morning, June 23, one day after Jurassic World: Fallen Kingdom debuted in area theaters, Bausinger was the guest reader of a Jurassic Park children's book at the Barnes & Noble in Fairless Hills, one of his Dino Boxes by his side, invaluable publicity in front of a dozen kids and their parents. Troy Bausinger, cofounder of Kids Dinosaur of the Month Club, reads a book about dinosaurs to children at the Barnes & Noble in Fairless Hills on June 23. To his left is one of his company’s Dino Boxes. He was a no-brainer invite. Debbi Carr, the store's community business development manager, called the Dino Box "a great idea." "Anything that gets kids interested in reading and learning," she said, suggesting applications beyond dinosaurs. Bausinger's already thinking along those lines. He mentioned construction and transportation boxes. We all know how popular Thomas the Train is.